Successfully Added Xiaomi Power Strip - 3 Sockets, 3 USB Ports, 250Volt, 10 Amp, 2500W, 1.8 Meter Lead, Anti-Slip Feet, Heat Resistant (Black) to your Shopping Cart. 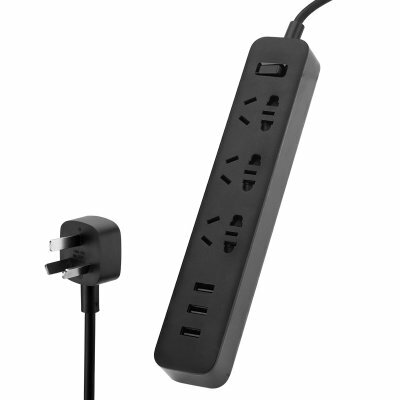 Simple elegant and compact power strip great for at home or on the road. This power bar from Xiaomi was specially designed with custom made components allowing it to be both smaller and lighter than similar power bars. This was achieved by radically redesigning the everyday power strip and incorporating customized components' from electronics specialist Joemex. The Xiaomi power bar has 3 plug sockets that each support two types of plugs allowing you to use it with plugs common in most of continental Europe as well as Australia, New Zealand, and China. USB ports are located on this power bar so you should have enough ports for all your gadgets be it a phone, tablet or camera. By utilizing a smart chip the USB ports can automatically identify the required power and offer the correct current up to 2Amps so you can swiftly charge your gadgets. Made from high-quality materials to guarantee safety the durable Xiaomi power strip has overload and prevent short circuit protection. With anti-slip rubber feet, this compact Xiaomi power strip sits perfectly on your desk or a polished surface. The Xiaomi 3 socket power strip comes with 12 months warranty, brought to you by the leader in electronic devices as well as wholesale chargers, adapters and power strips..